>And in with the new! 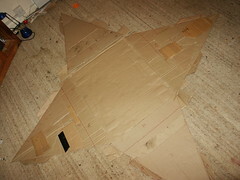 And here’s Cardboard Coffee Table mkII – new and improved. I’m not going to reveal the design yet, but it’s been in my head for a while. Somehow all the bits of wood will be incorporated into this one. Anyway, this is the base of the pyramid with the four sides laid out where they will go. Since i did this layout my LSW (being very LS today!) pointed out that it was a bad way to glue it together as it would be trying to spring apart. So that’s what the second photo is. Her cunning plan is to glue it together like this first, flat. 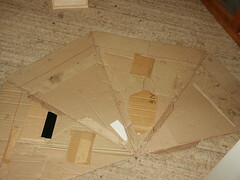 Then when it’s totally set, under pressure, bend it round into a pyramid shape and glue it to the base. I still think it’ll need some black gaffer tape, but we’ll have to see! More tomorrow when the glue’s set.